Thomas Brennan helps build healthy, vital, and resilient communities with transit and non-motorized transportation. Thomas, the firm’s Portland office leader, has 20 years of experience, including multimodal planning, corridor studies, and regional transportation. He specializes in transit service design and policy, parking management, transportation demand management, and strategic transportation planning. He excels at multimodal and comprehensive transportation plans for cities ranging in size from Seattle to Rochester, Minnesota. He understands the important cross-section between transportation system planning, interagency coordination, and policy. Thomas has played a leading role in some of the most successful strategic transportation plans in the country. For Seattle, Boulder, and Chapel Hill, NC, he has created master modal plans that integrate all transportation systems into one vision and that help cities influence transit services. For Portland, Thomas developed an innovative way to apply the “triple bottom line approach” – simultaneously evaluating economics, equality, and quality of life – before developments or policies affect connectivity. 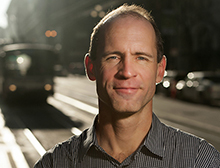 Share the post "Thomas Brennan helps build healthy, vital, and resilient communities with transit and non-motorized transportation."